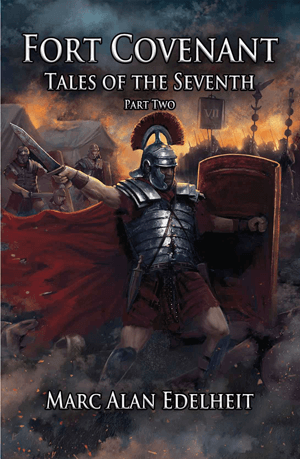 The bestselling, award-winning author of STIGER’S TIGERS delivers the action-packed Part Two in the Tales of the Seventh series. In this military fantasy, Ben Stiger is given a simple mission: march his understrength company to the Cora’Tol garrison far to the southeast. Once there, he is to take a fellow officer into custody and promptly return. But when Stiger arrives, he finds the Rivan have destroyed the garrison and slaughtered the inhabitants of the valley. Suddenly, what was supposed to be a quick and easy task turns into something far more dangerous. With a Rivan army now moving to flank the imperial army to the west, Stiger makes a desperate decision. Short on rations, and hopelessly outnumbered, he must find a way to delay the enemy so Third Legion can react to this dire threat before it is too late. The solution lies in Fort Covenant, a forgotten place with a history important not only to his people, but the elven nations as well. Set amidst the backdrop of an epic war, there are greater forces at work than the young Stiger can begin to imagine.